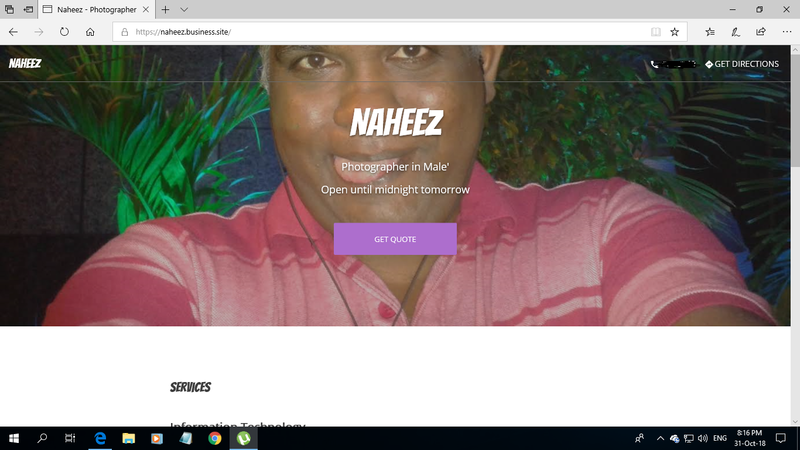 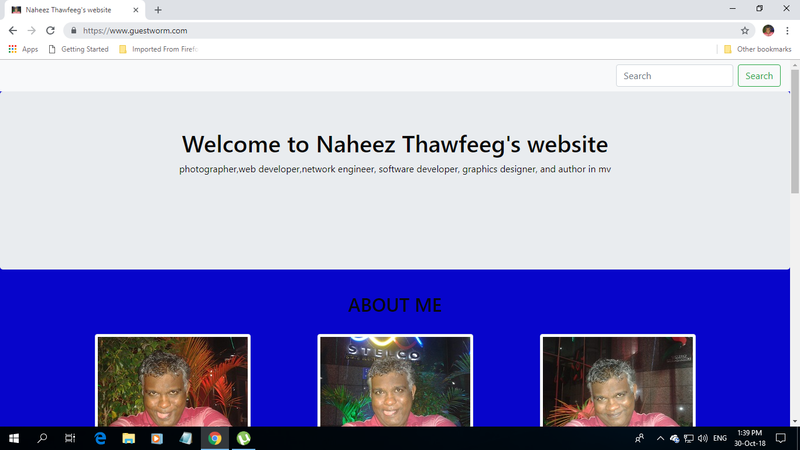 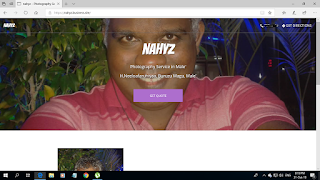 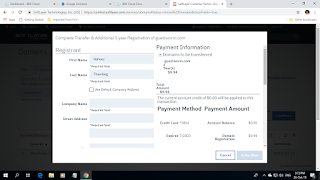 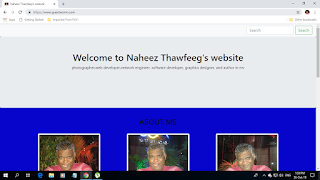 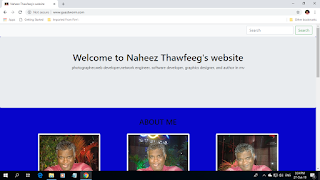 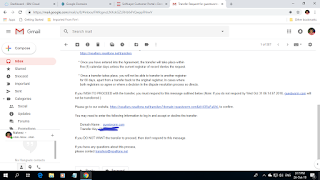 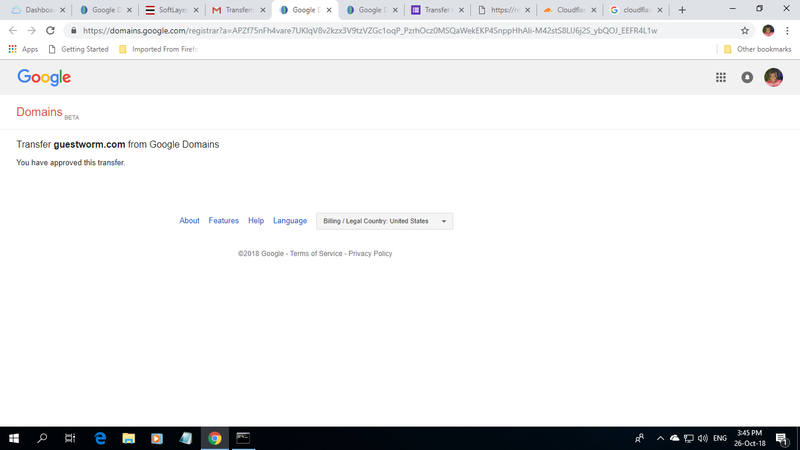 This month of October 2018 is now nearly over and here is what I did to conclude this month...I earlier tonight setup Google® My Business™ profiles and I have created two free websites ( https://naheez.business.site and https://nahyz.business.site ) which comes and is included in Google® My Business™. 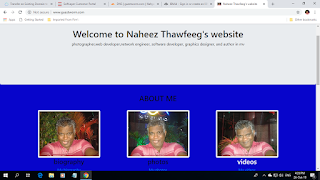 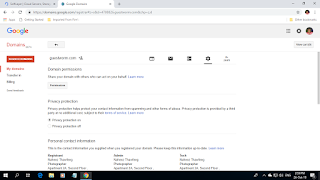 I also finished setting up my two profiles in Google® My Business™. 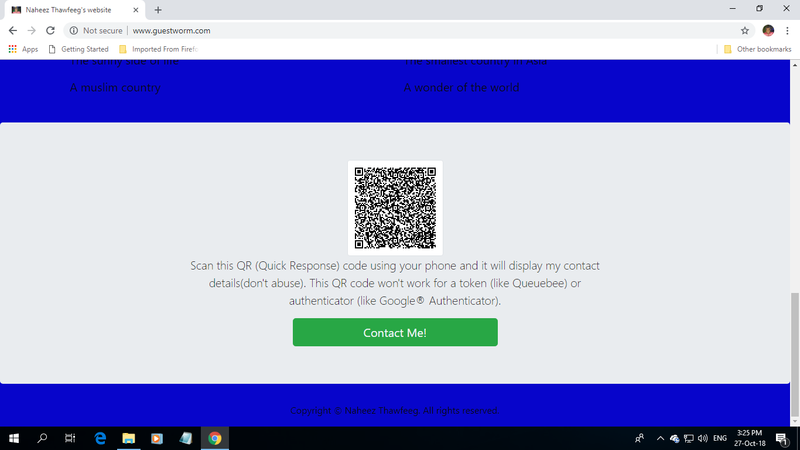 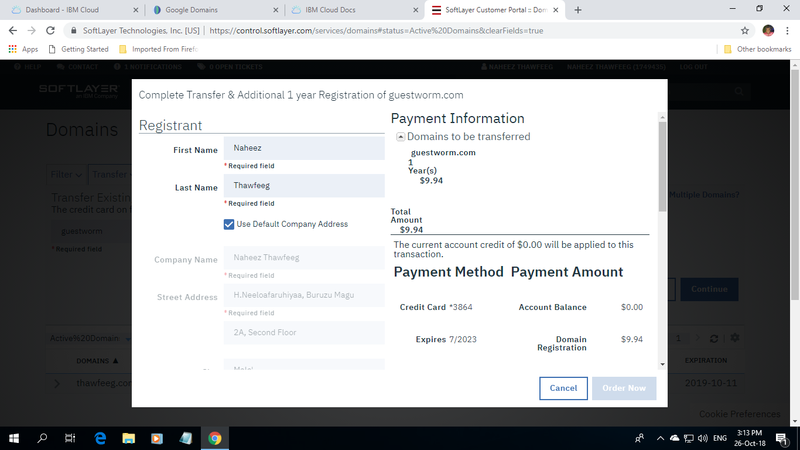 I last night enabled HTTPS secure connection to my personal website www.guestworm.com . 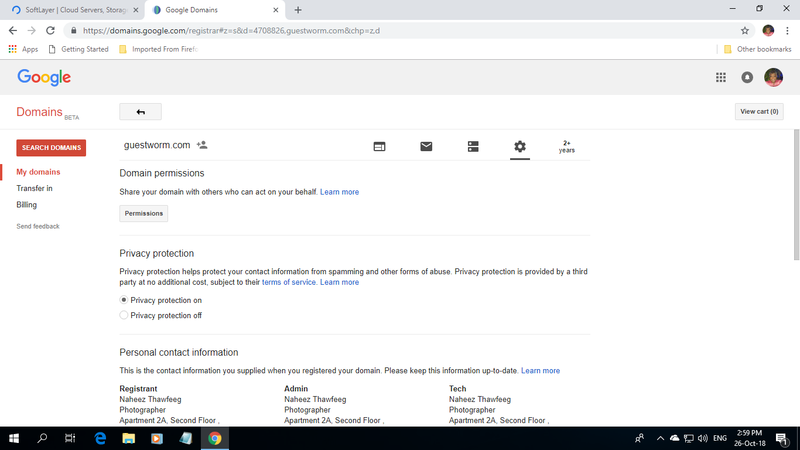 Now all my 4 blogs and personal website has HTTPS enabled by default. 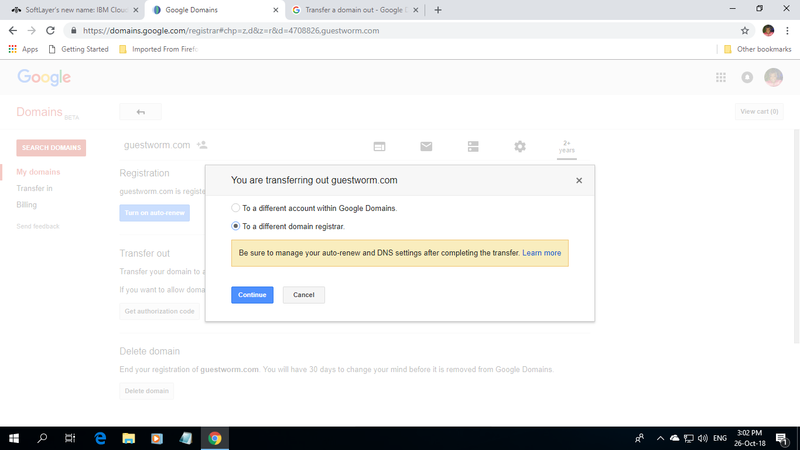 Google® Cloud Platform enables SSL/TLS (Secure Socket Layer/Transport Layer Security ) certificates through Let's Encrypt® ( https://letsencrypt.org/ ). 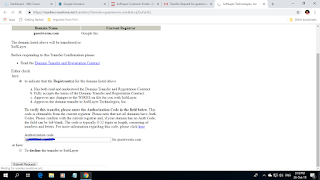 Google® Blogger™ also supports SSL certificates through Let's Encrypt®. 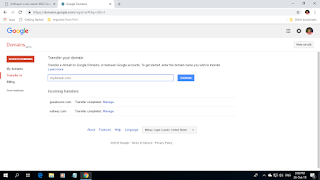 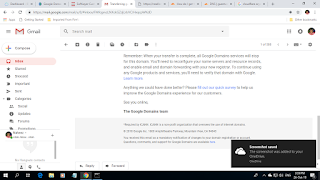 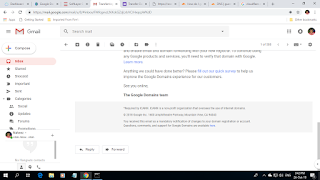 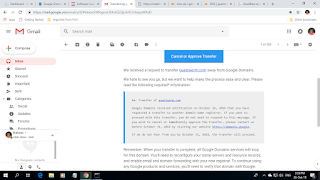 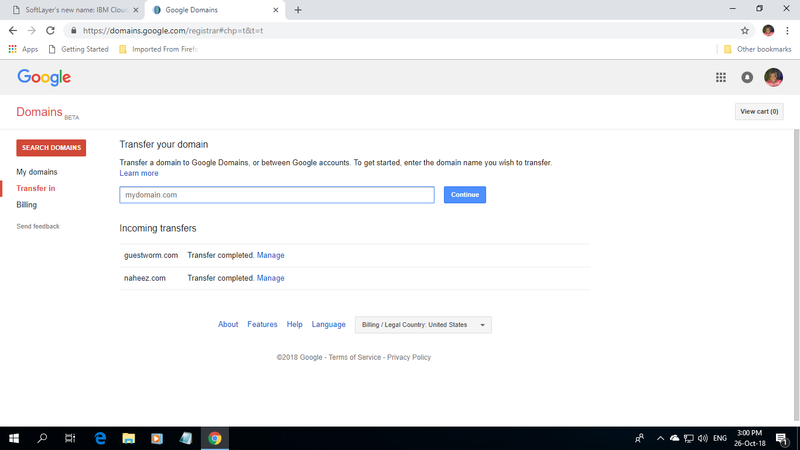 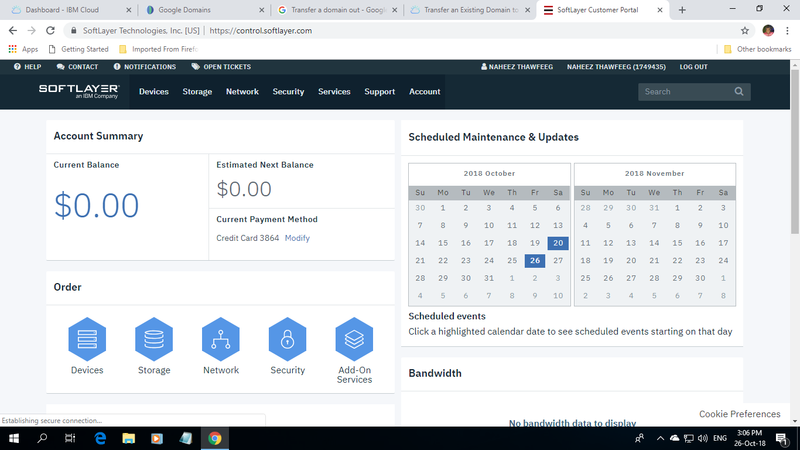 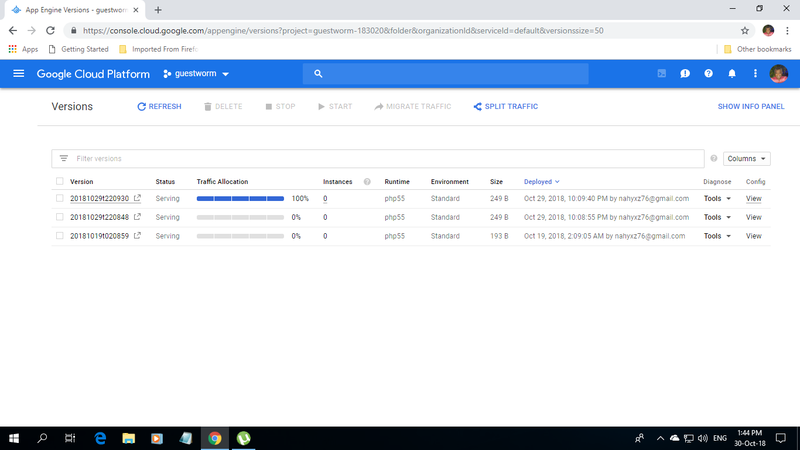 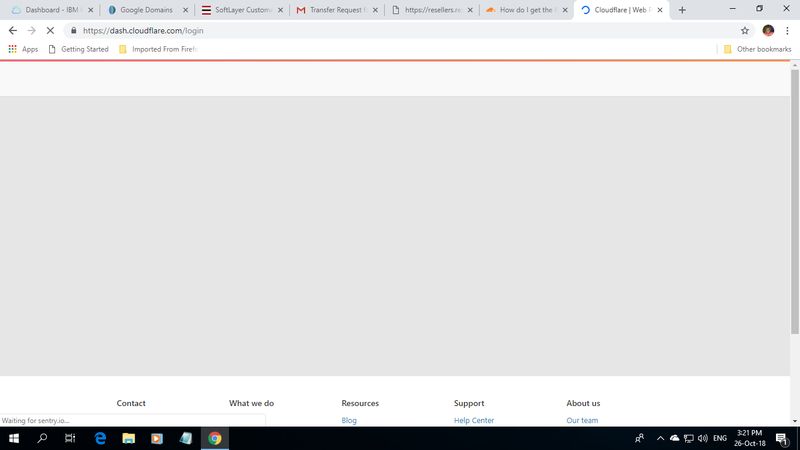 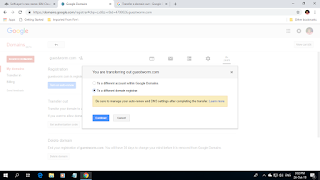 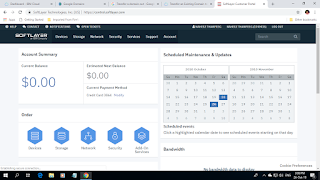 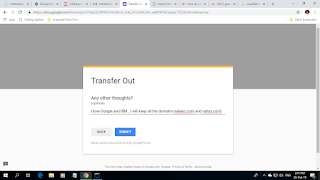 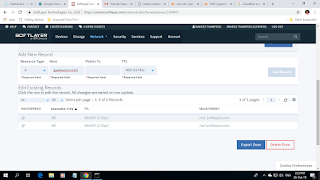 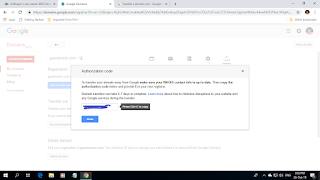 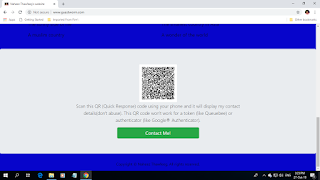 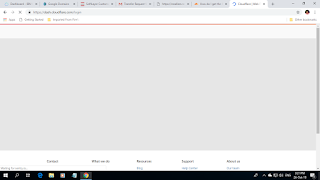 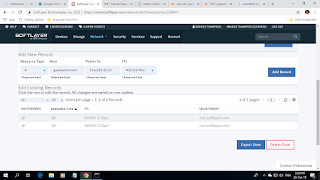 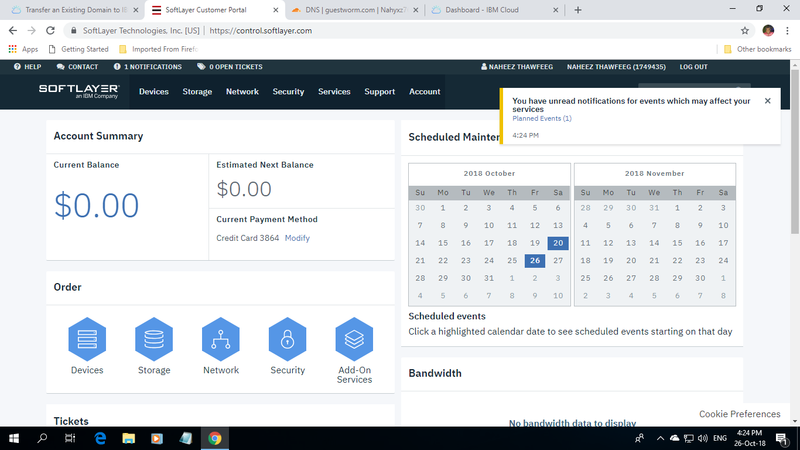 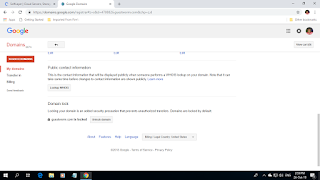 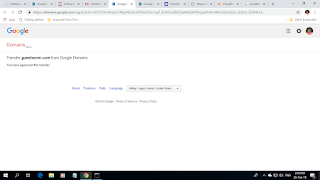 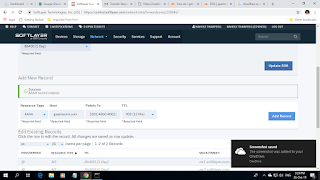 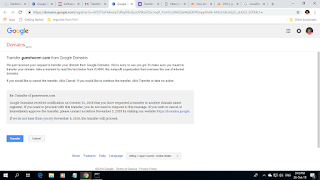 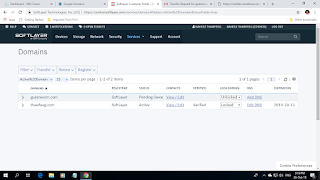 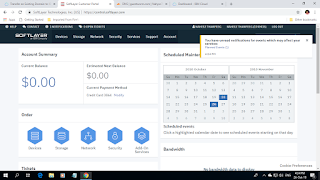 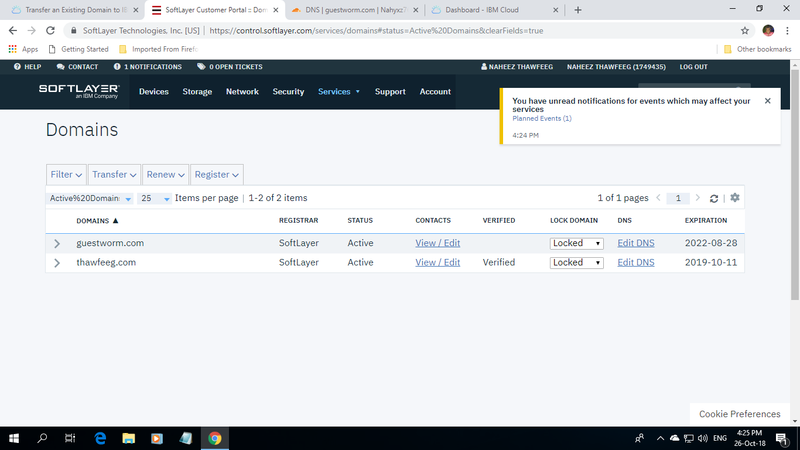 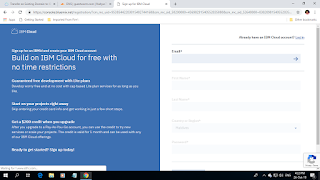 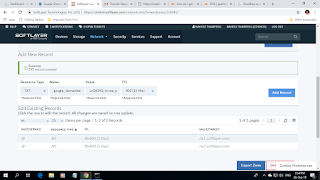 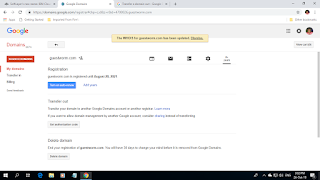 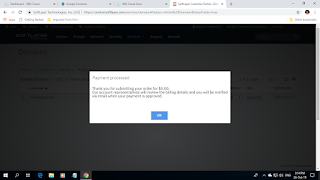 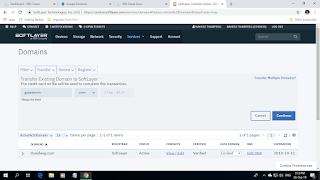 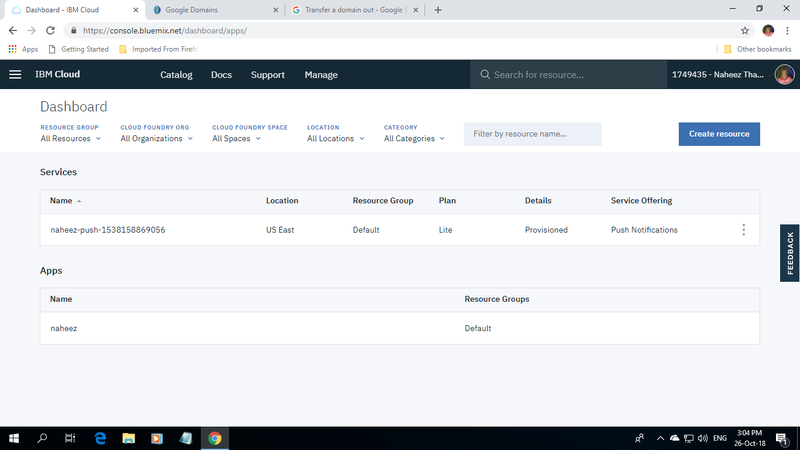 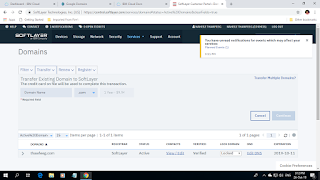 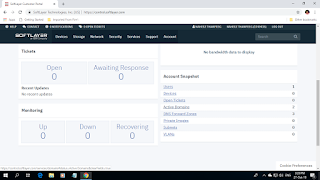 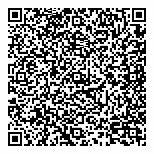 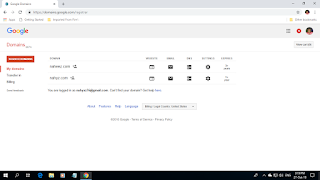 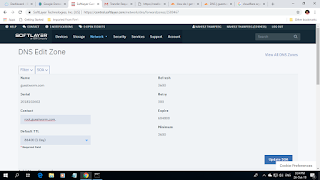 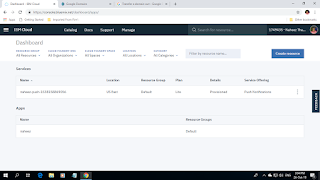 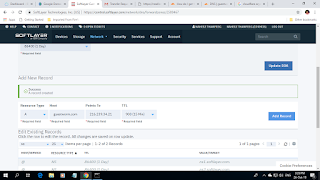 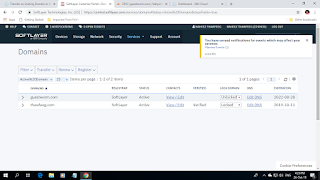 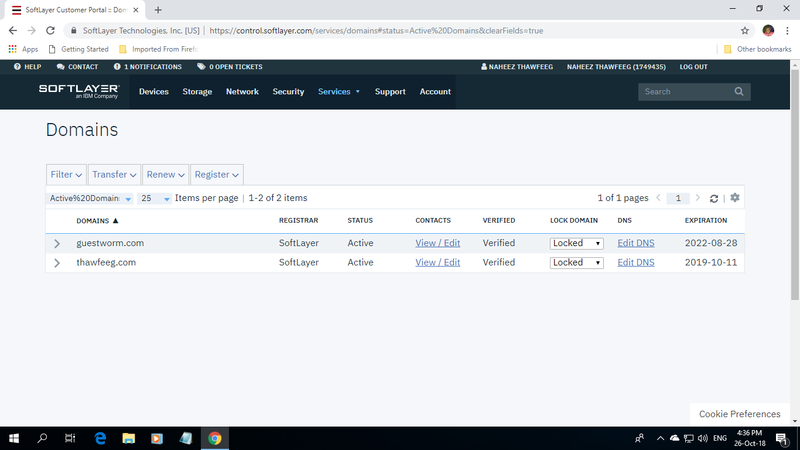 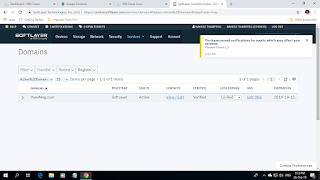 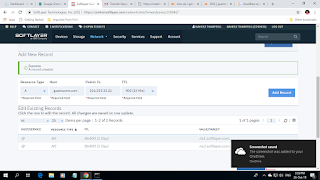 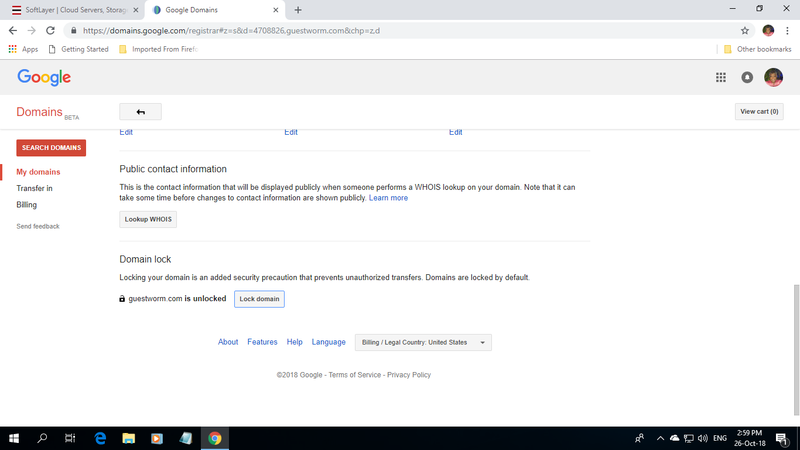 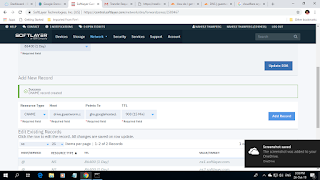 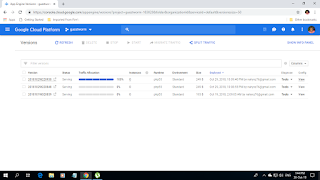 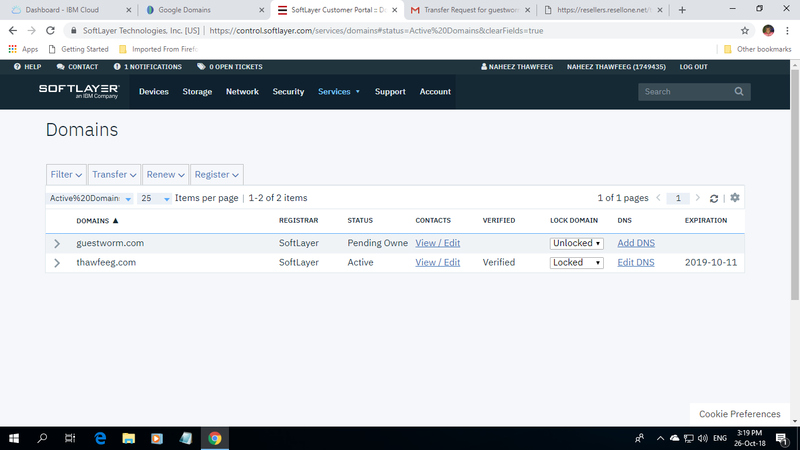 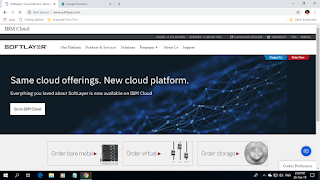 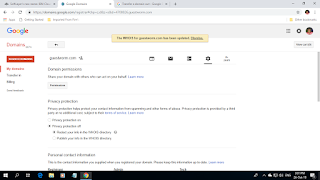 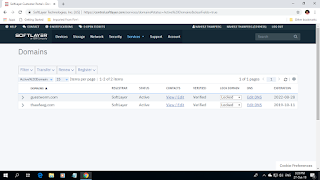 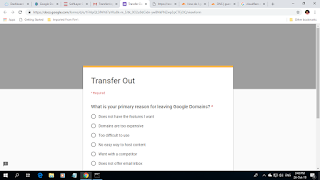 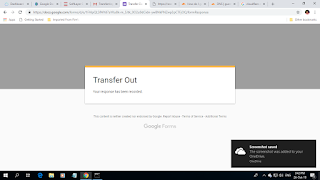 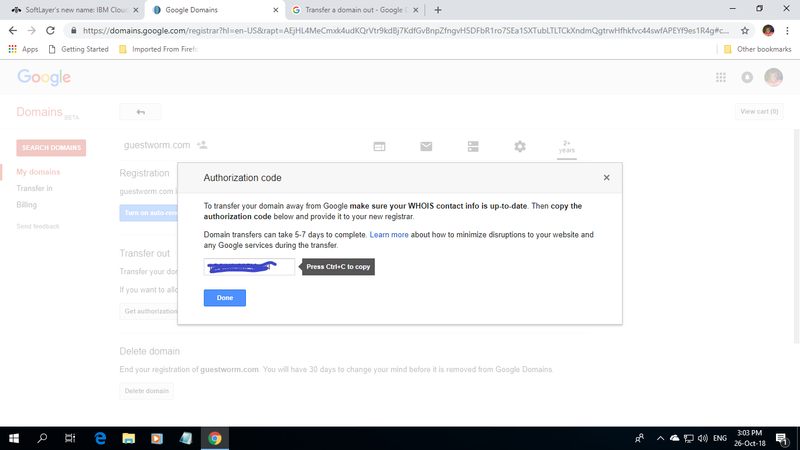 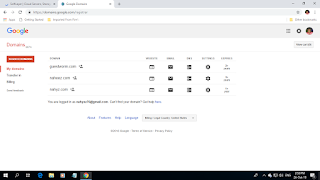 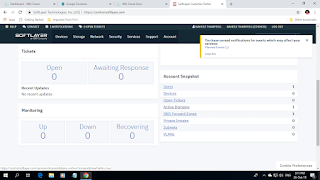 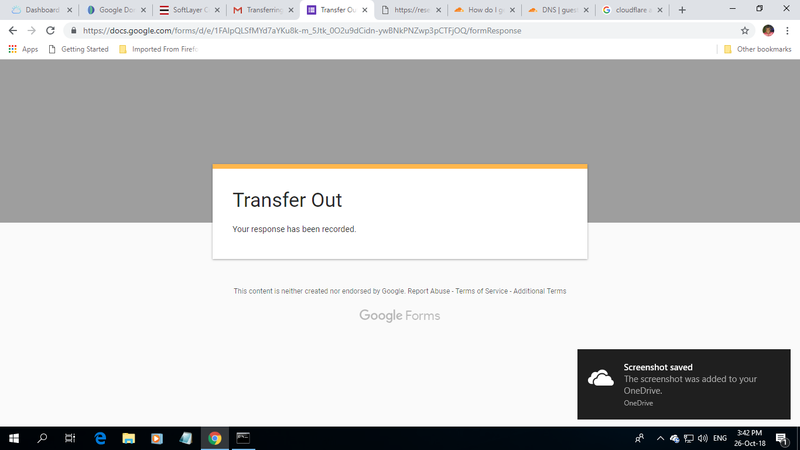 I had to delete the previous versions of my personal website in the powerful Google® Cloud Computing Platform because it supports only 50 version of one web app in the free tier, before uploading the HTTPS enabled website. 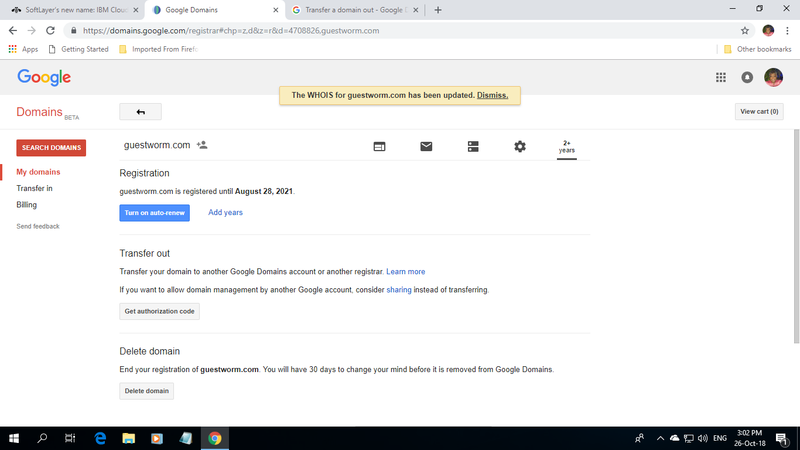 I have been using it since last year. 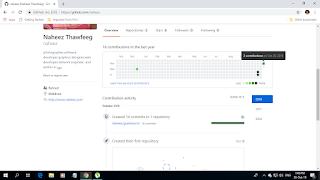 The source code files are at my repository at GitHub® , https://github.com/naheez . 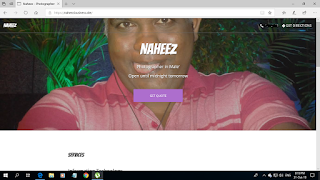 The month of October is ending and I hope my friends recover from their financial problems. 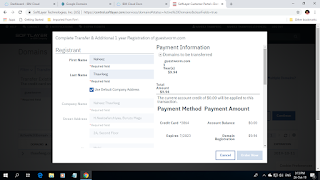 This is one of the financially toughest months I ever had these past few years. 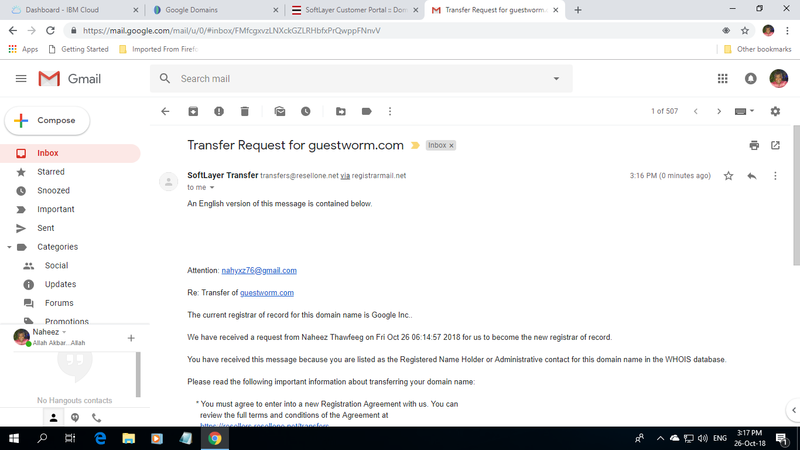 Yesterday, I have already finished transferring my personal website domain guestworm.com to IBM®. Now IBM® is the registrar of my domain guestworm.com, Google®s powerful Cloud Computing Platform will provide the hosting of my website and Google®s world class G Suite™ will provide the emails and many other services, and the exceptional services of Cloudflare® will provide the DNS (Domain Name System) management and CDN (Content Delivery Network). 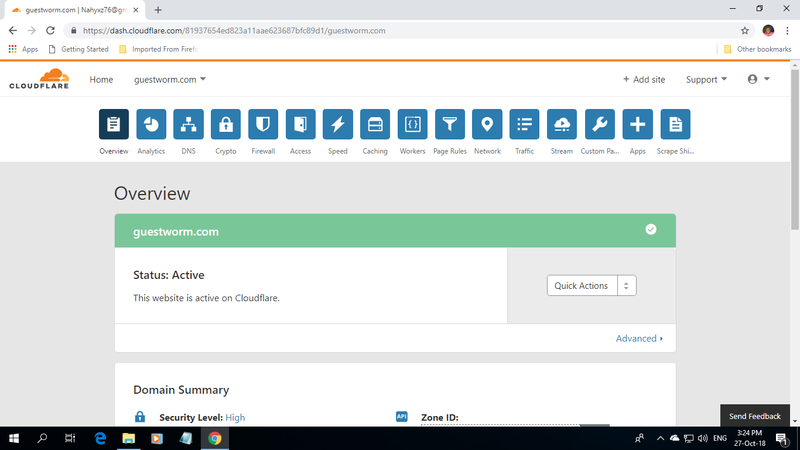 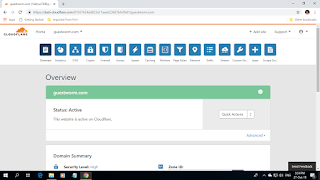 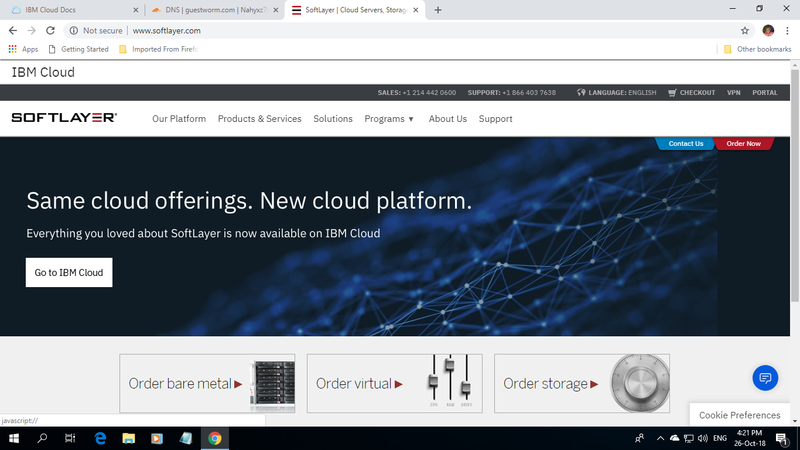 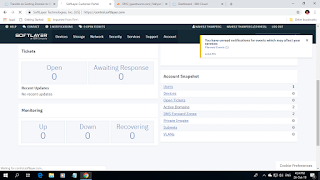 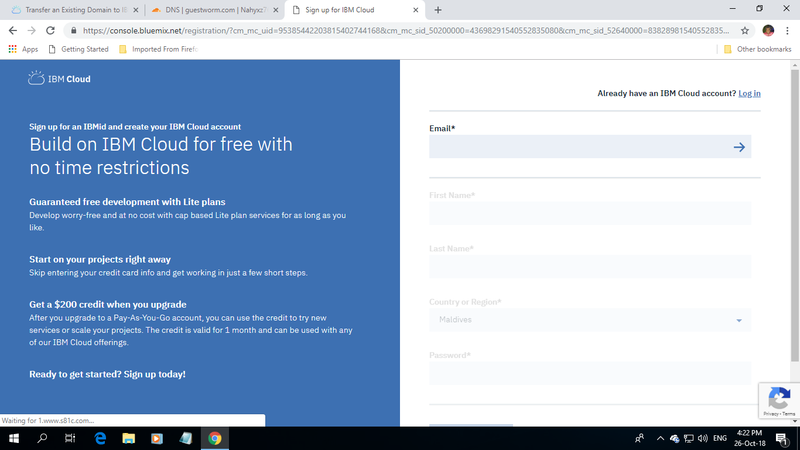 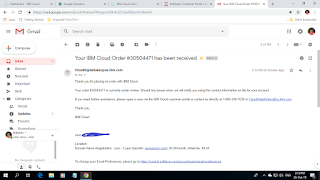 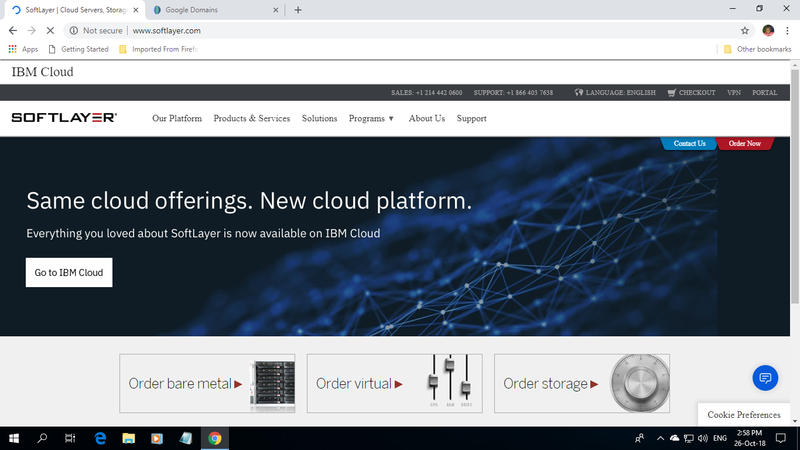 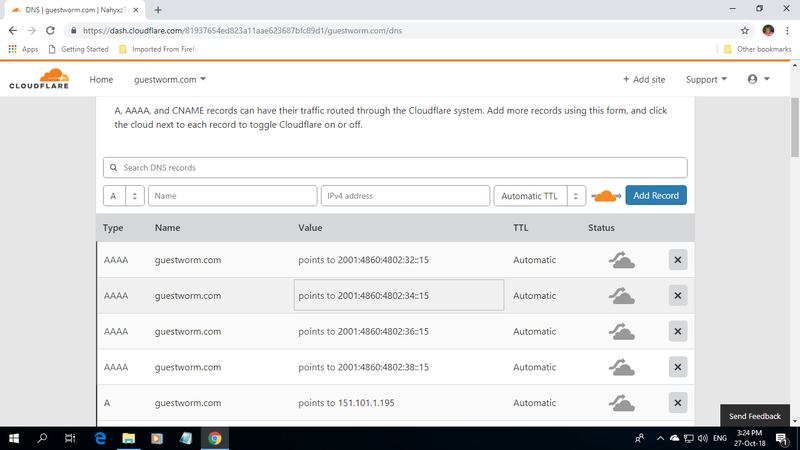 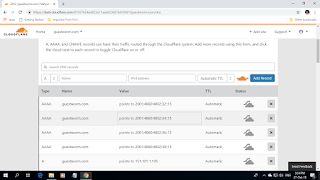 I had set the TTL (Time To Live) to "Automatic" in Cloudflare® when I transferred my domain guestworm.com and there was no interruption or down time to my personal website www.guestworm.com when it was transferred to IBM® Cloud Softlayer™. 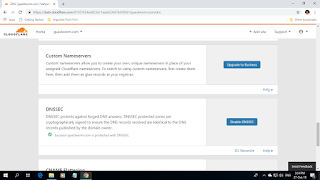 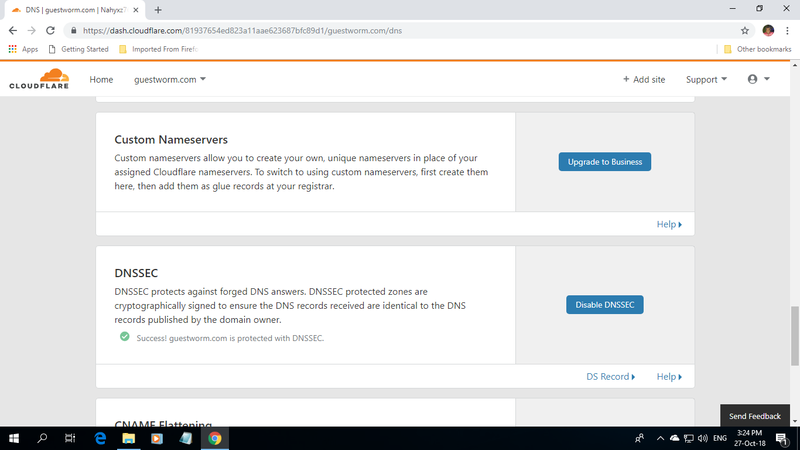 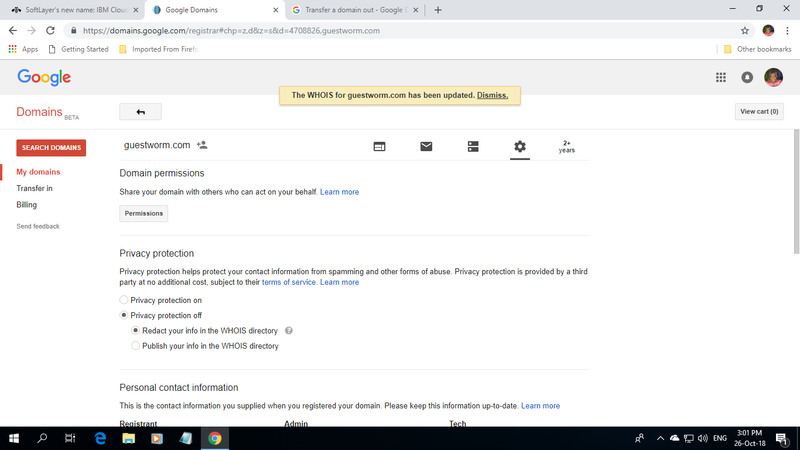 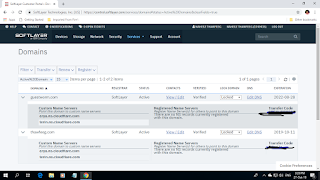 DS (Delegation Signer) / DNSSEC (Domain Name System Security Extensions) has also been enabled for my domain guestworm.com by Cloudflare® because the previous registrar Google Domains™ supports DS records at registry level. 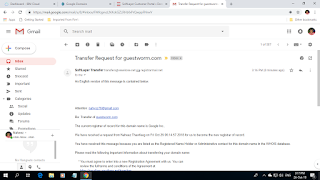 I have now enlisted three U.S. technology companies, IBM®, Google®, and Cloudflare® to serve my personal website www.guestworm.com. 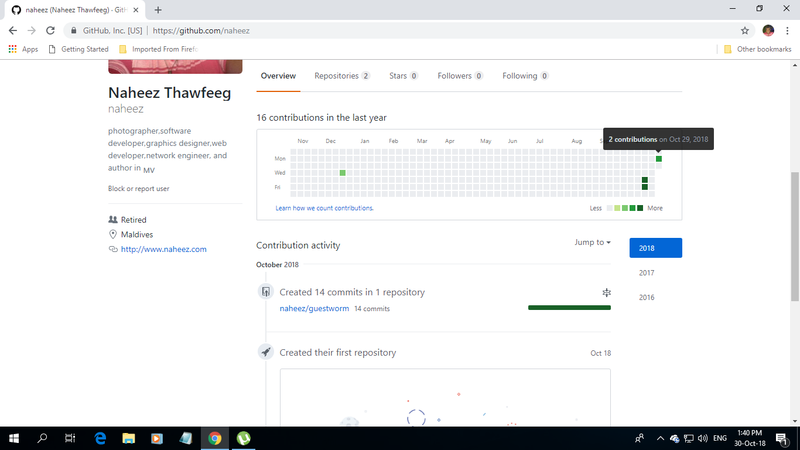 This completes what I have planned to accomplish for this month of October 2018. 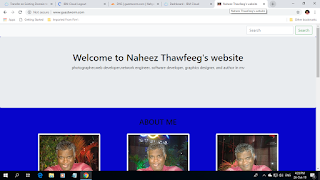 There were many other tasks I had in my mind but I was not able to complete them because I and all my friends were in a financial crisis. 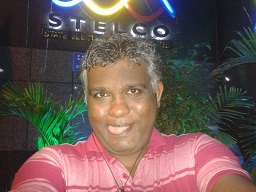 I will do those things very slowly some other time when they all have recovered from their financial problems. 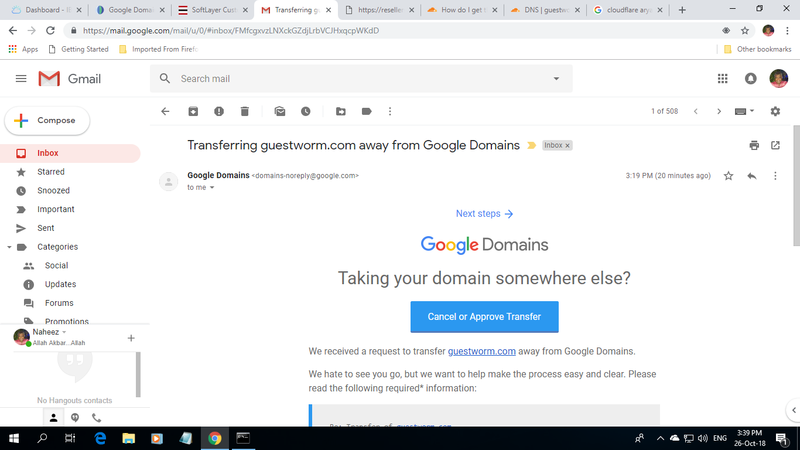 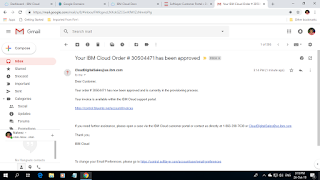 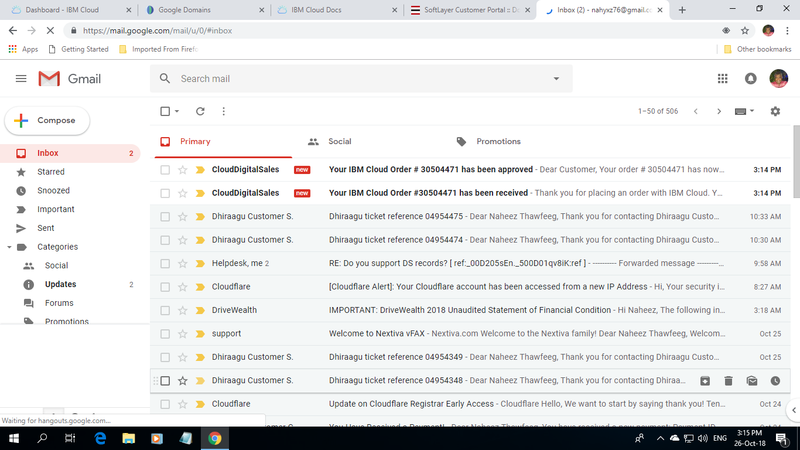 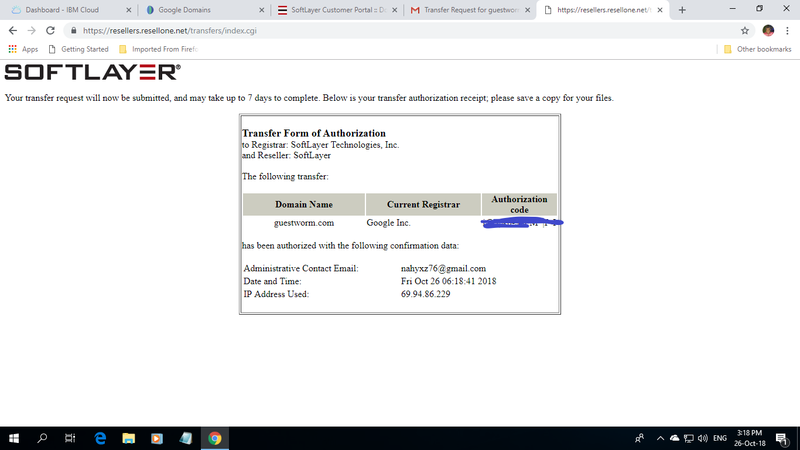 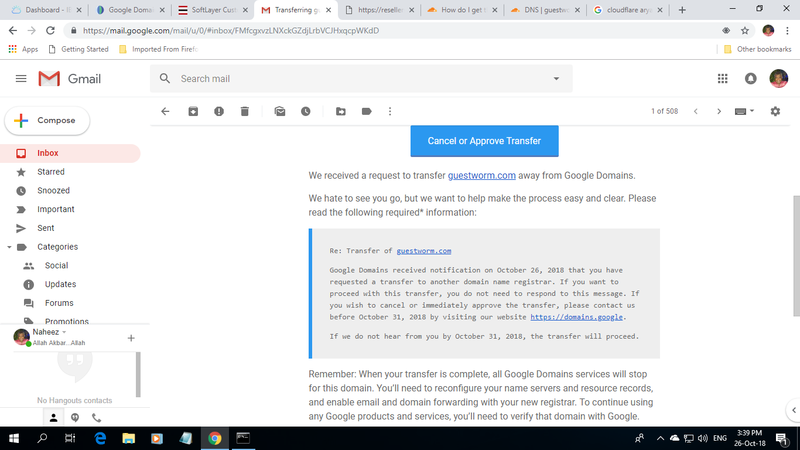 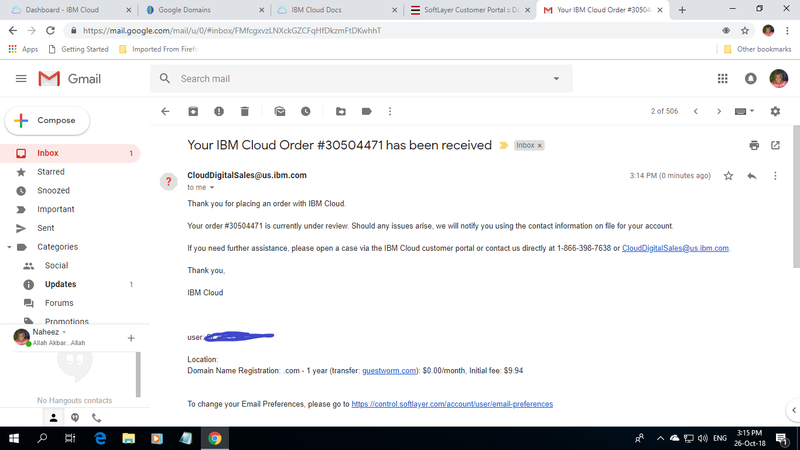 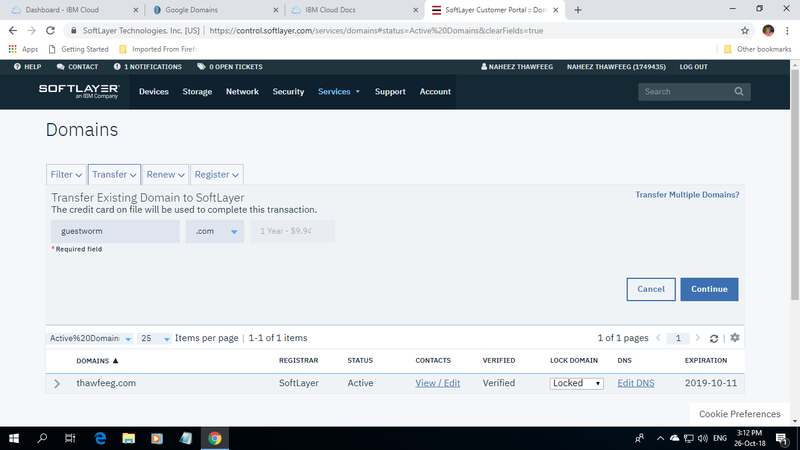 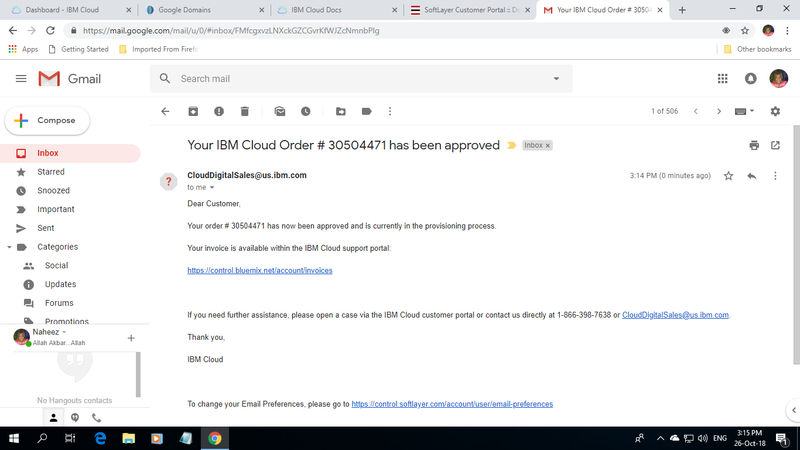 Today is the blessed Friday...To fulfill my plans for this month of October 2018, I late this afternoon transferred my domain guestworm.com to IBM® Cloud from Google Domains™. 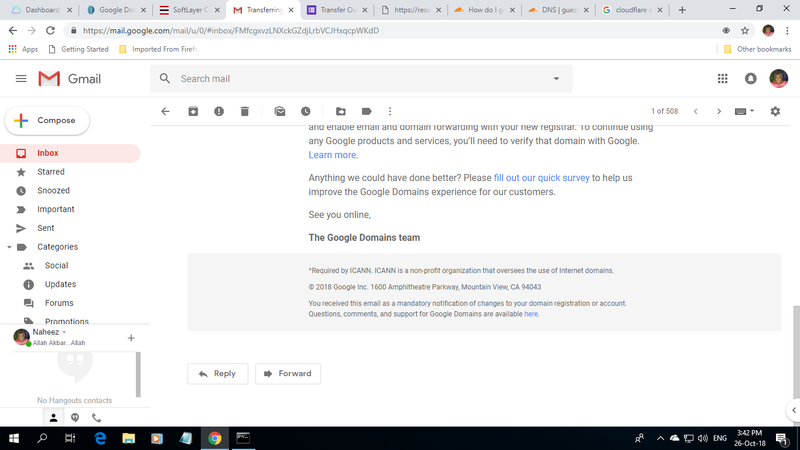 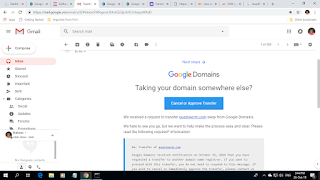 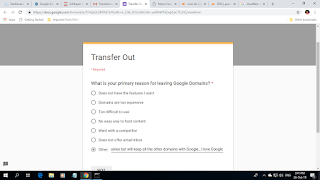 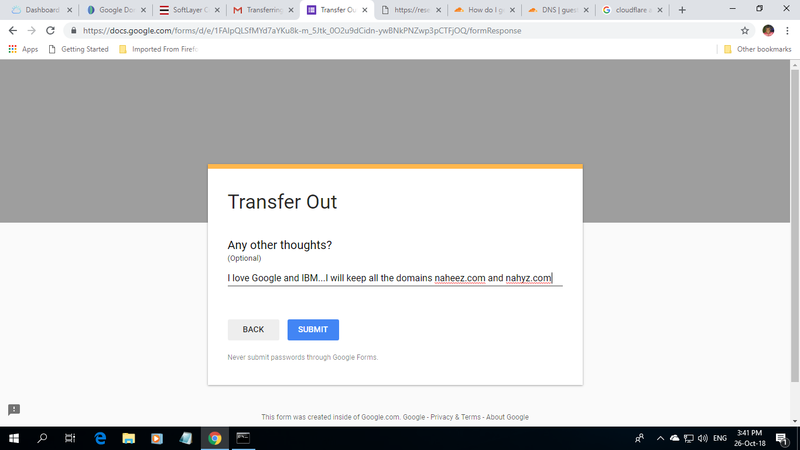 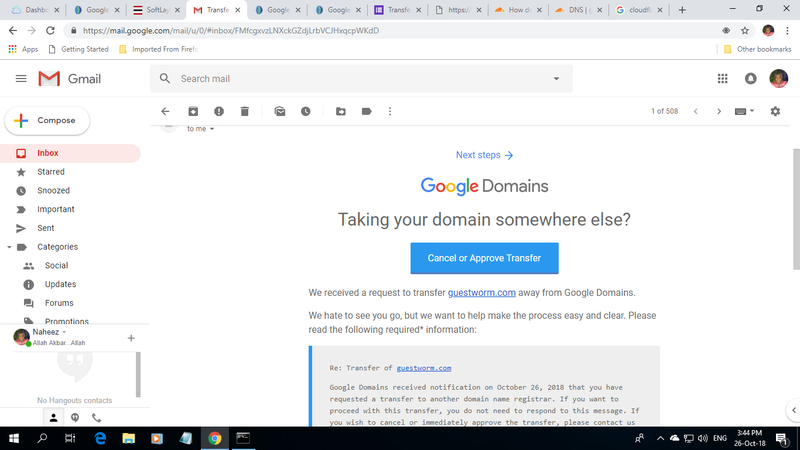 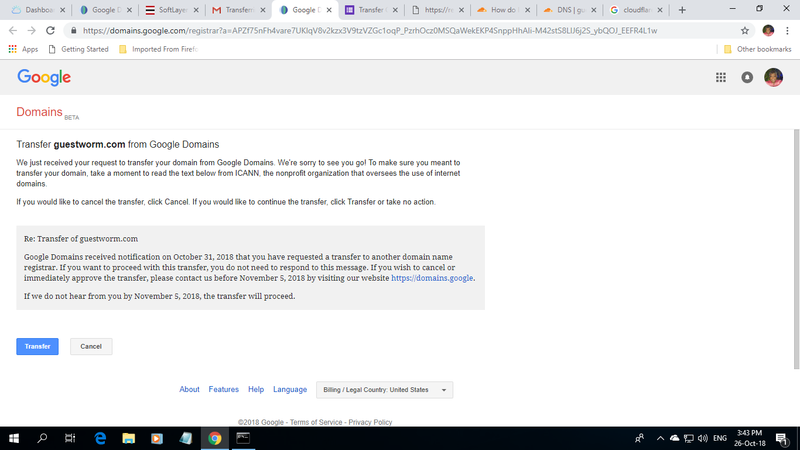 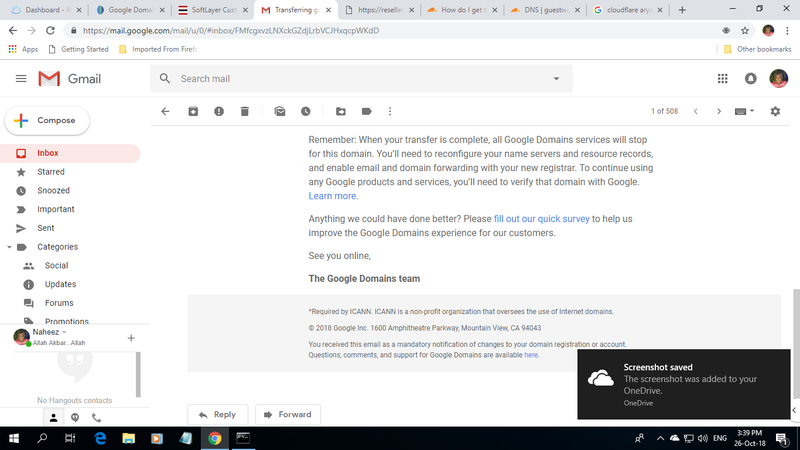 But I intend to keep my web hosting (Google Cloud™) and G Suite™ with Google® and also I intend to keep my domains naheez.com and nahyz.com with Google®. 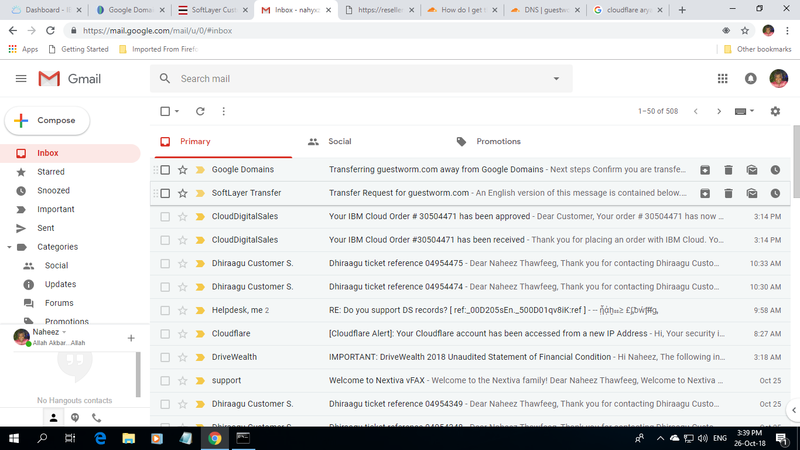 The DNS and security provider will be still Cloudflare® and there won't be any interruption while my domain guestworm.com is transferred from Google Domains™ to IBM® Cloud as I have copied the same DNS records: A,AAAA,MX,CNAME,SPF,TXT, and DKIM from Cloudflare® to IBM™ Cloud and which all point to Google™ and is provided by Google®. 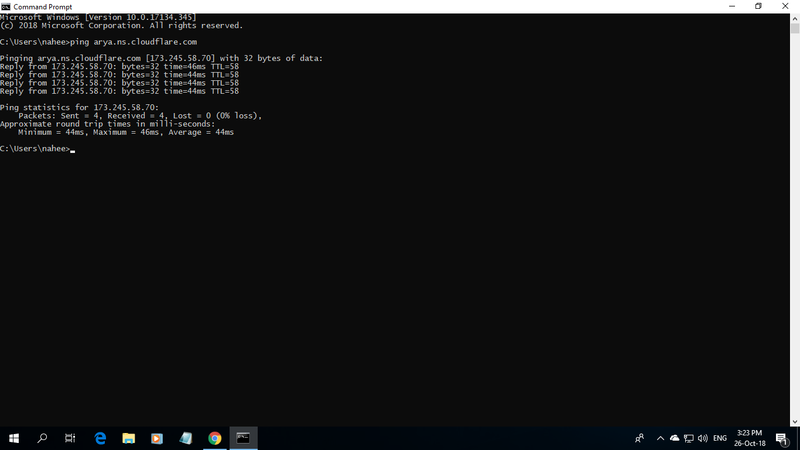 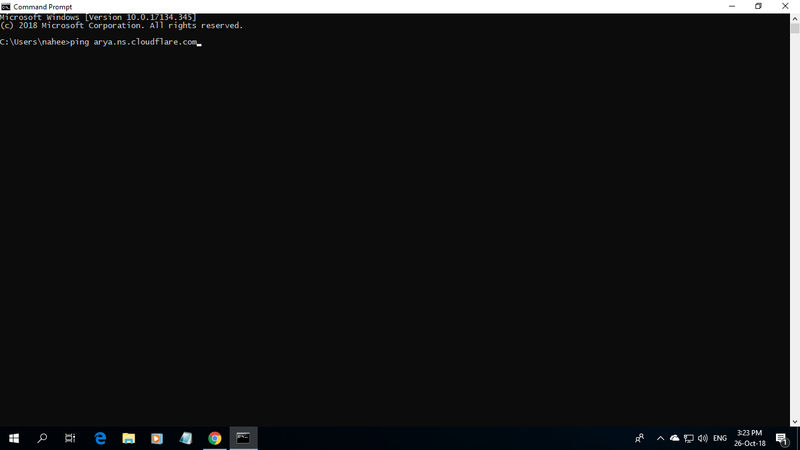 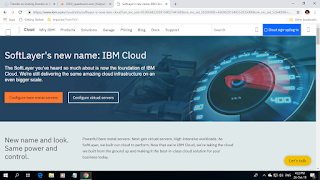 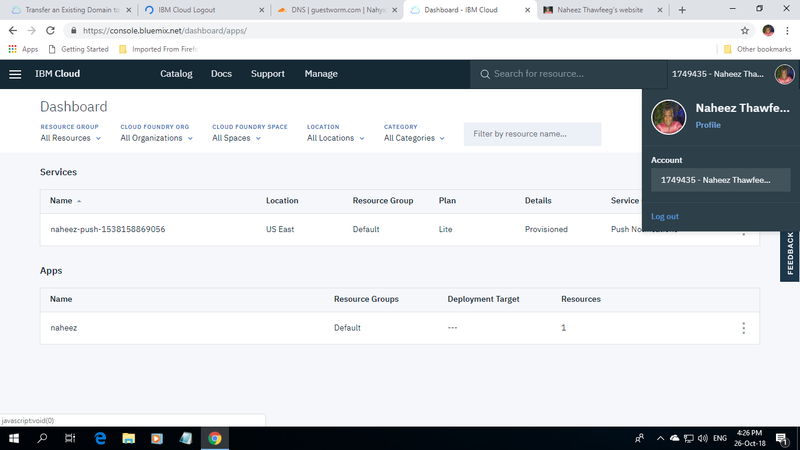 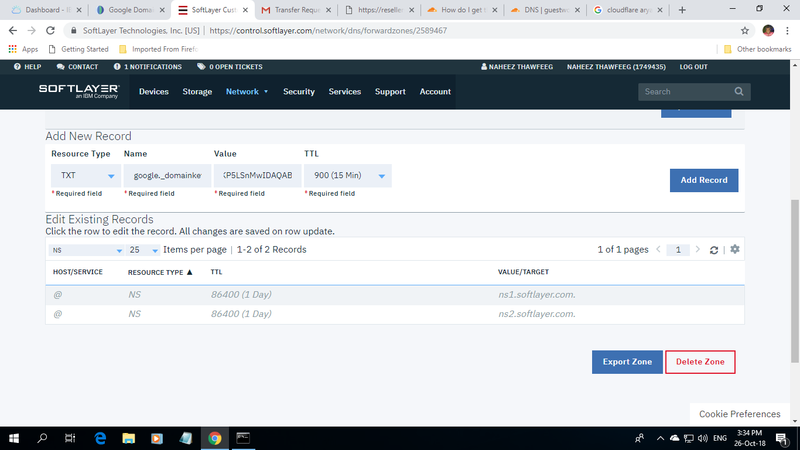 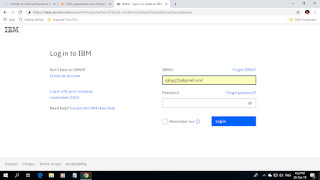 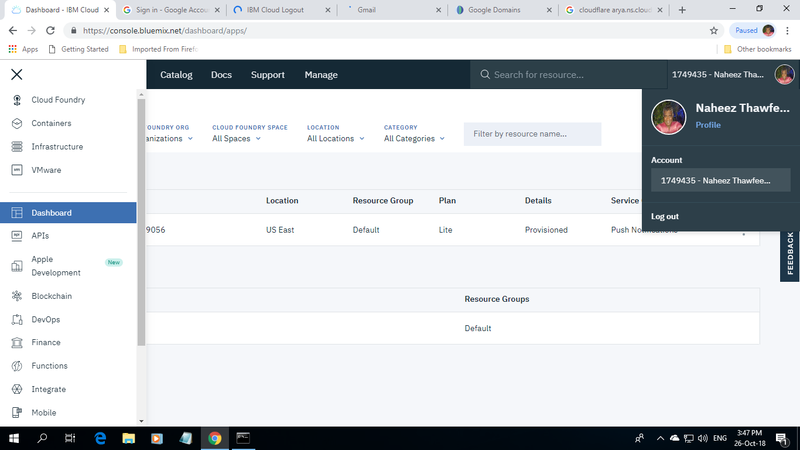 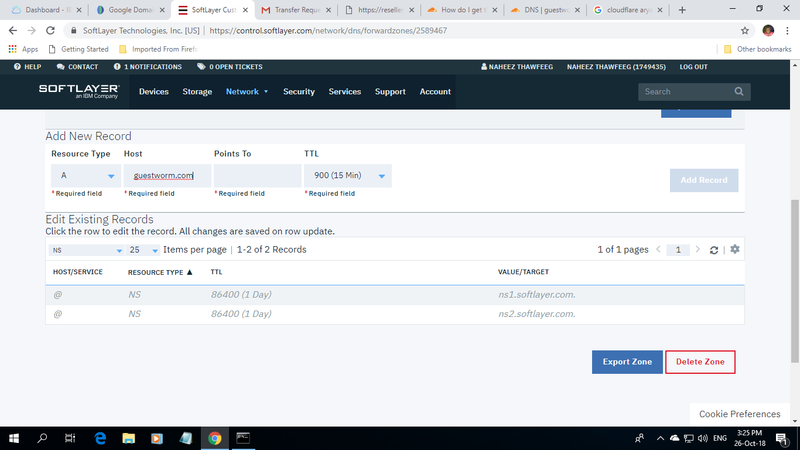 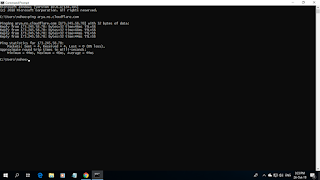 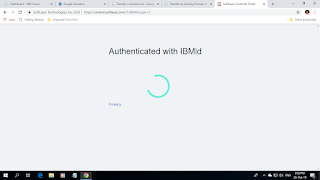 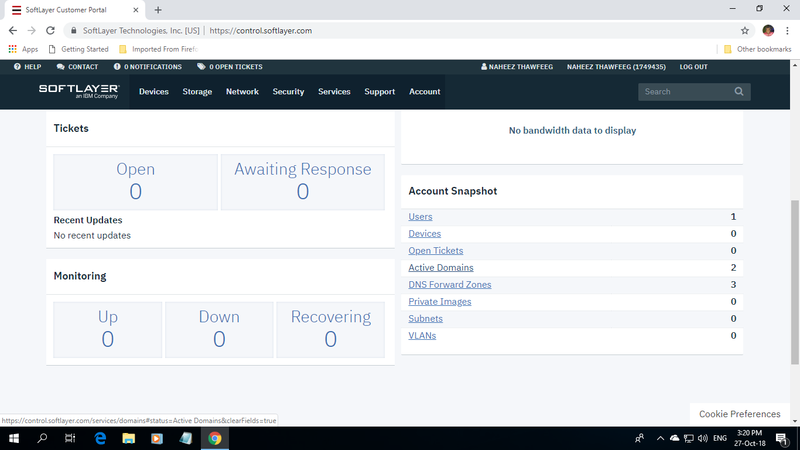 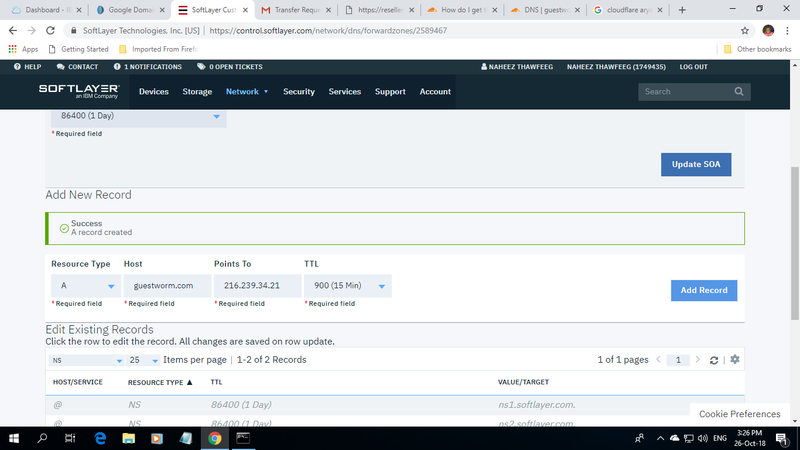 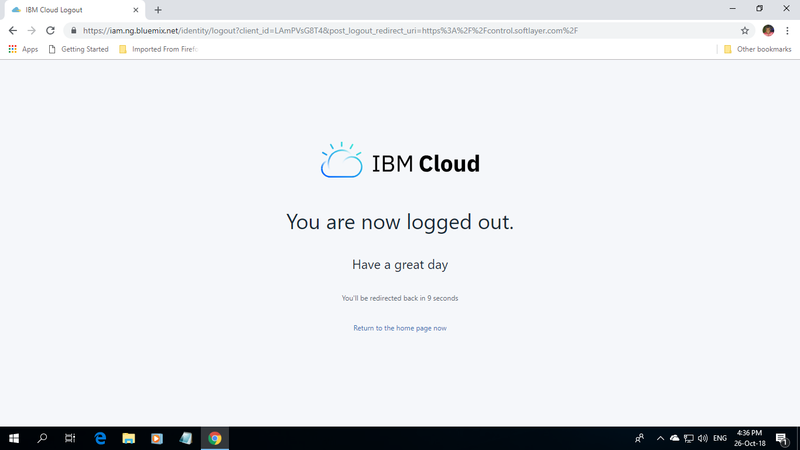 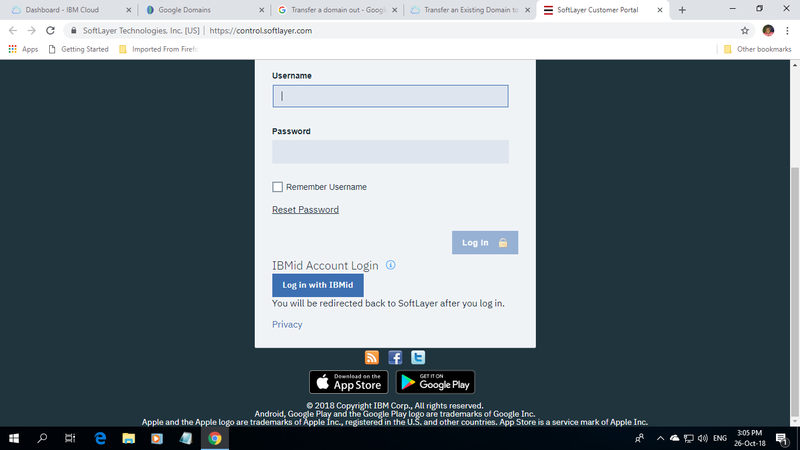 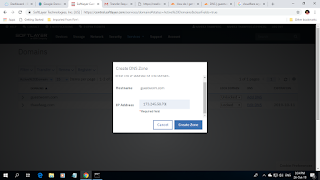 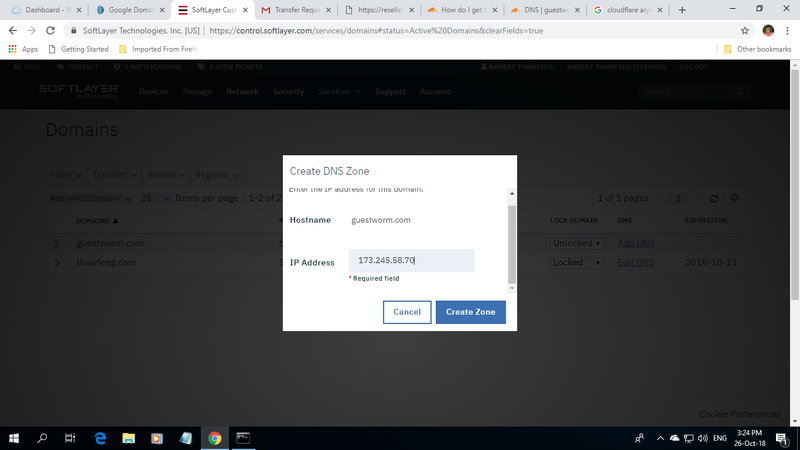 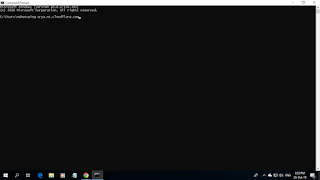 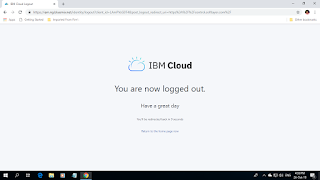 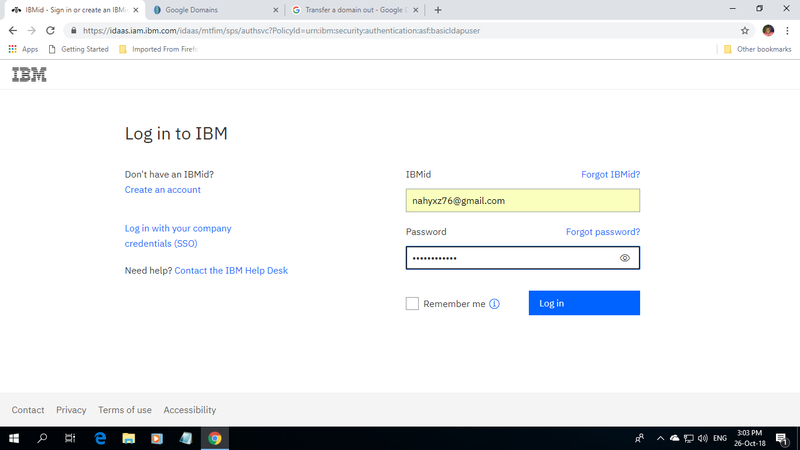 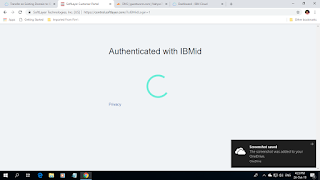 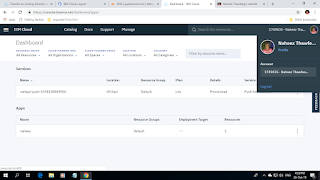 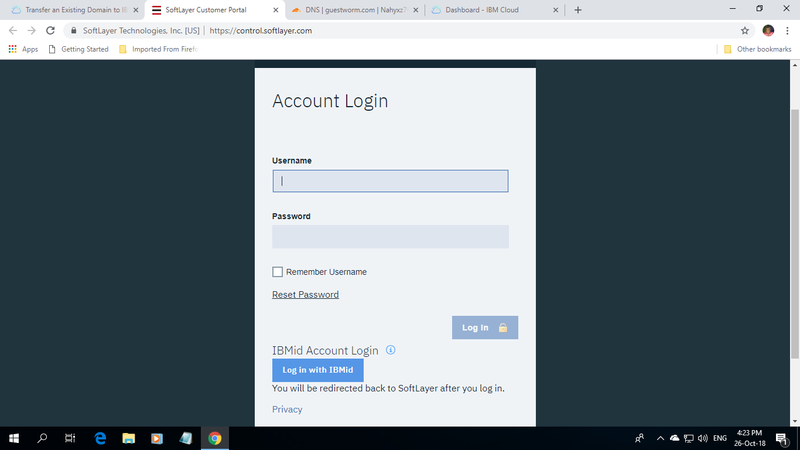 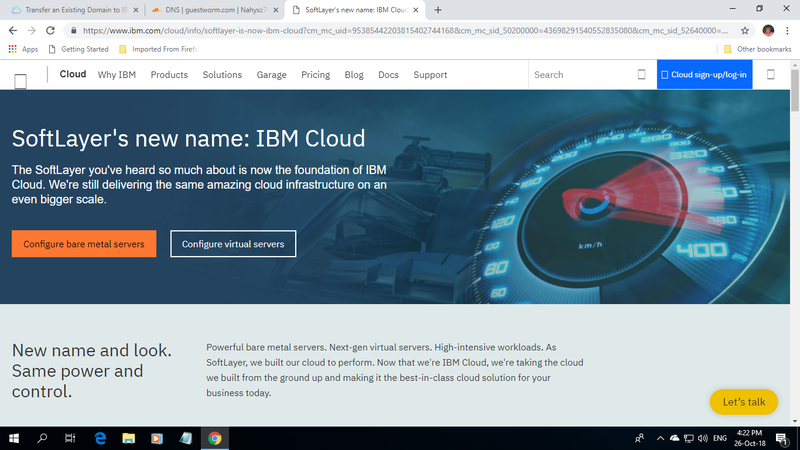 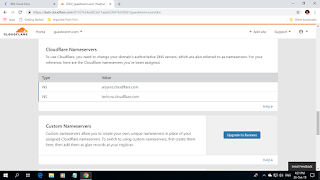 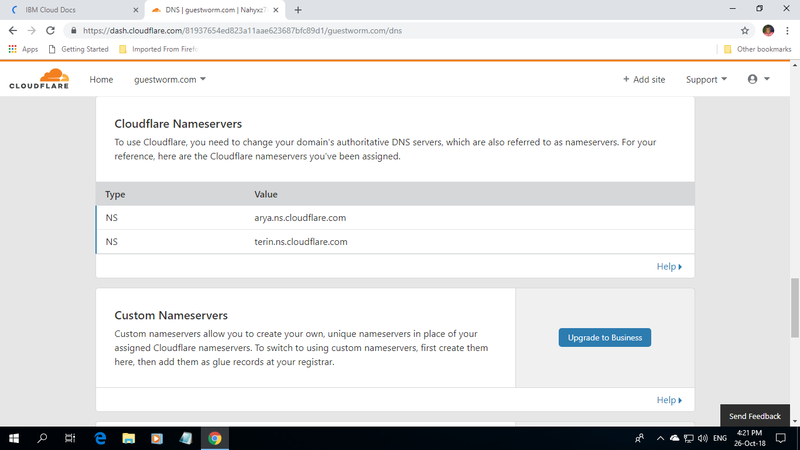 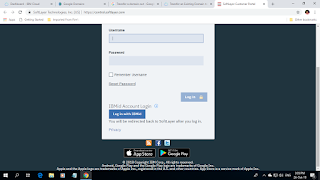 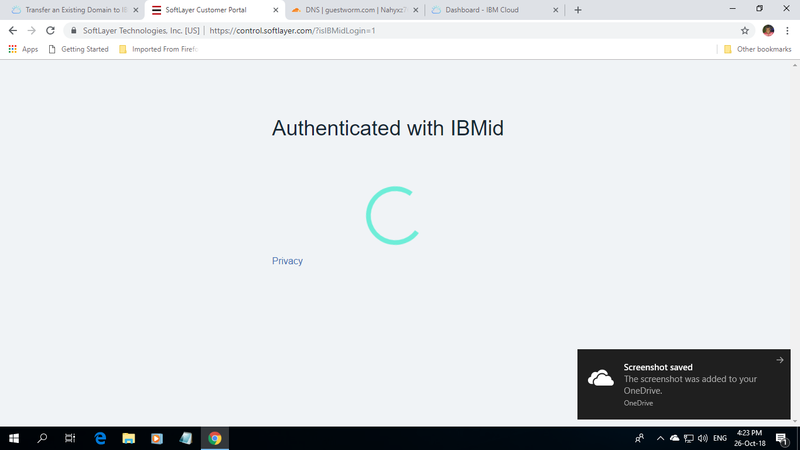 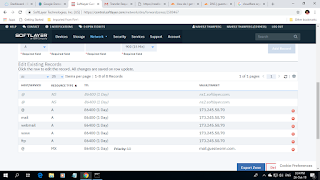 I did the DNS setup in IBM® Cloud after setting the zone IP (Internet Protocol) to that of Cloudflare®'s Name Server (NS) after pinging Cloudflare® from a command prompt of my computer. 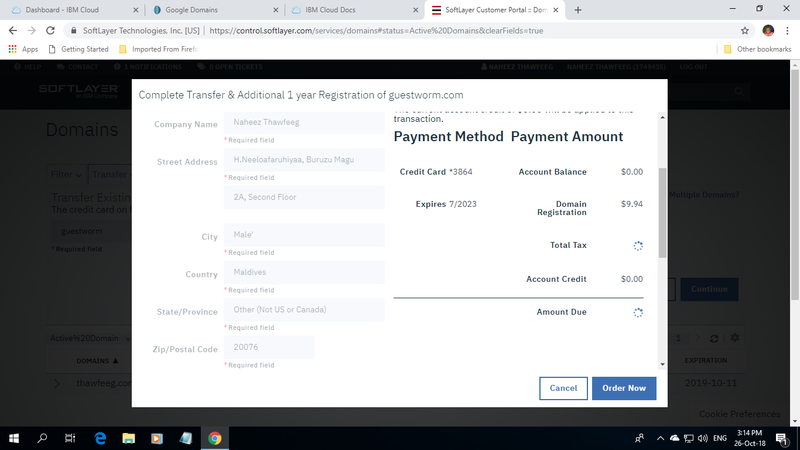 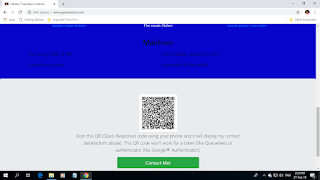 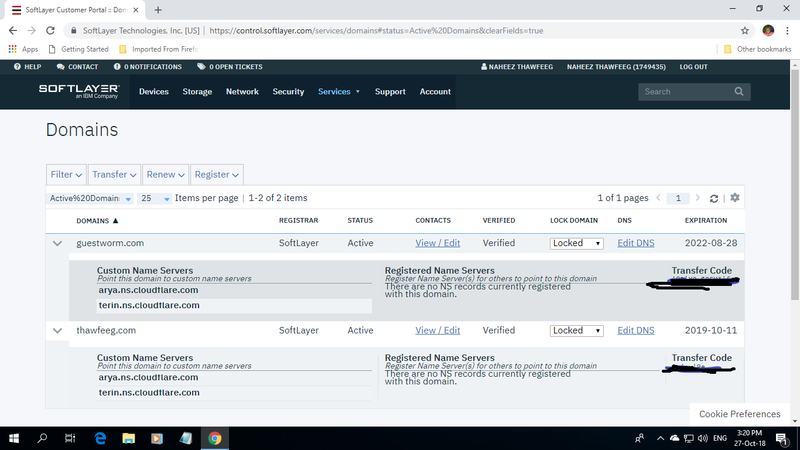 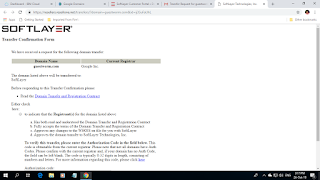 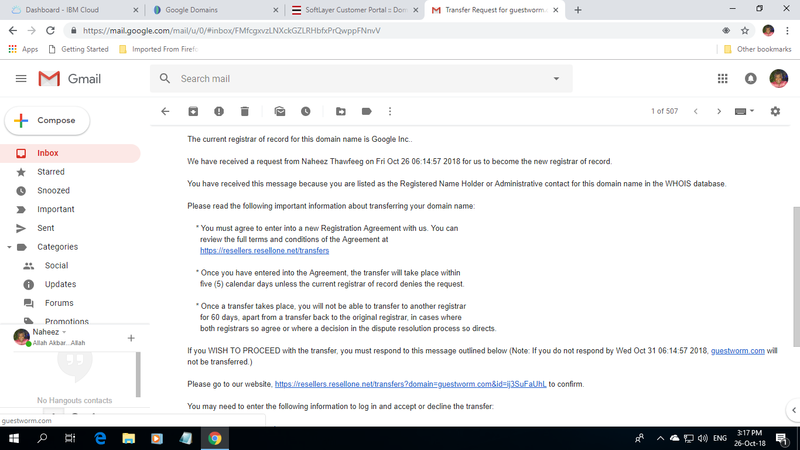 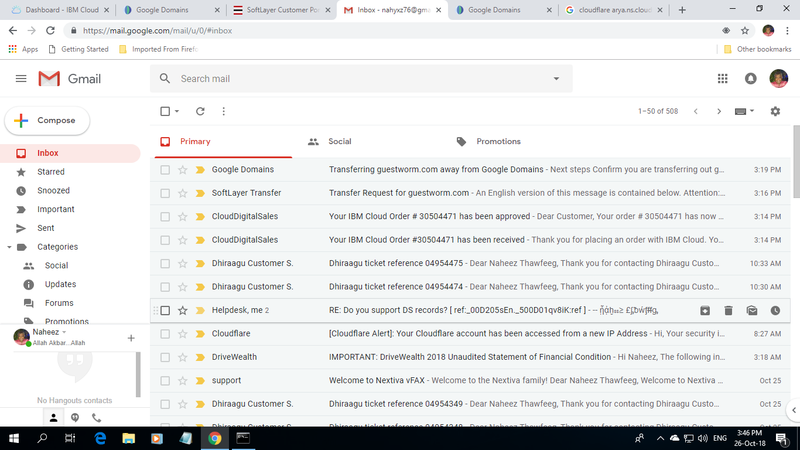 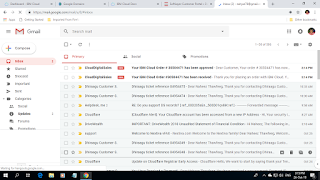 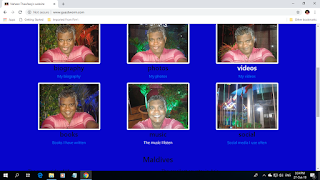 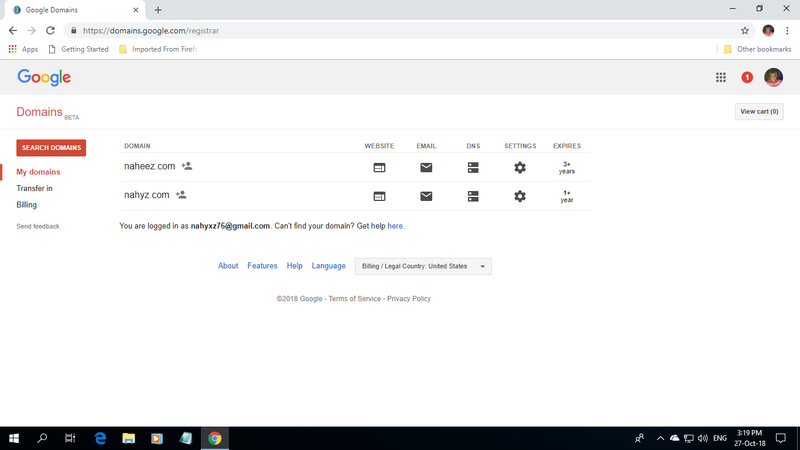 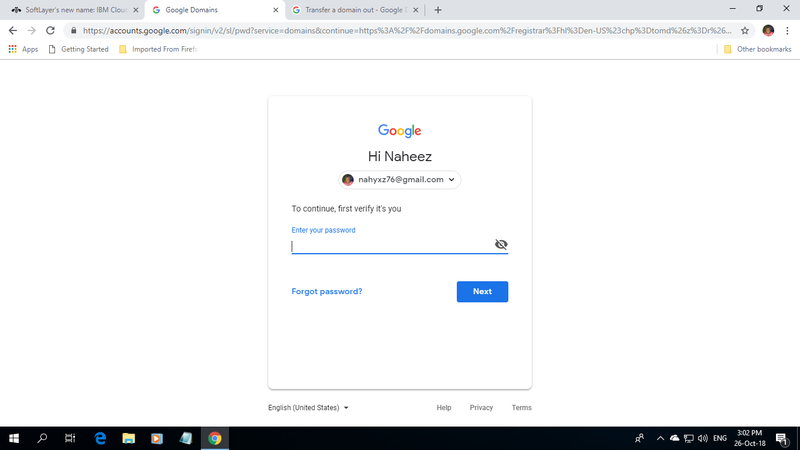 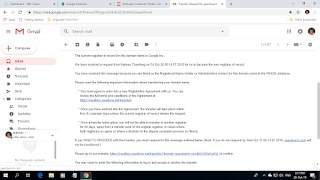 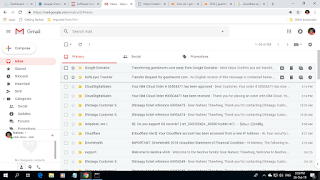 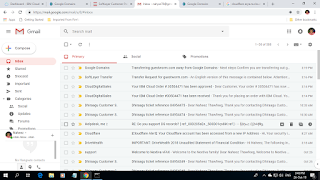 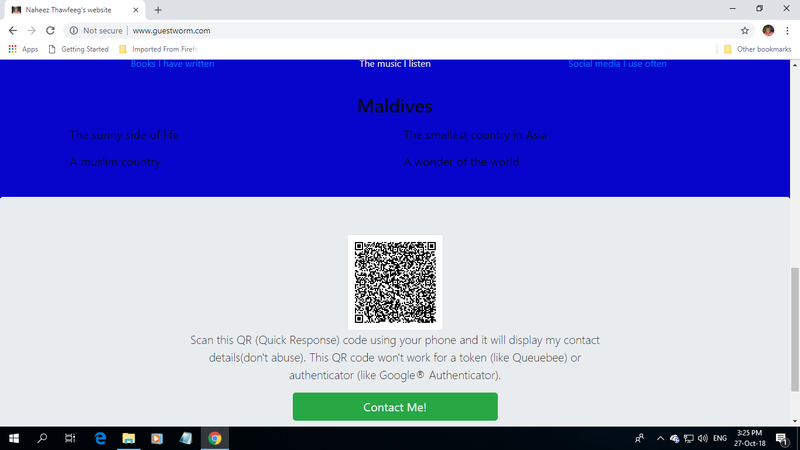 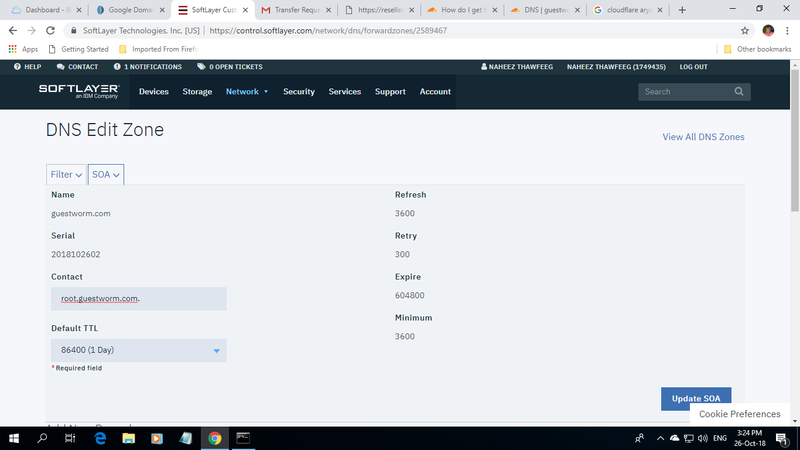 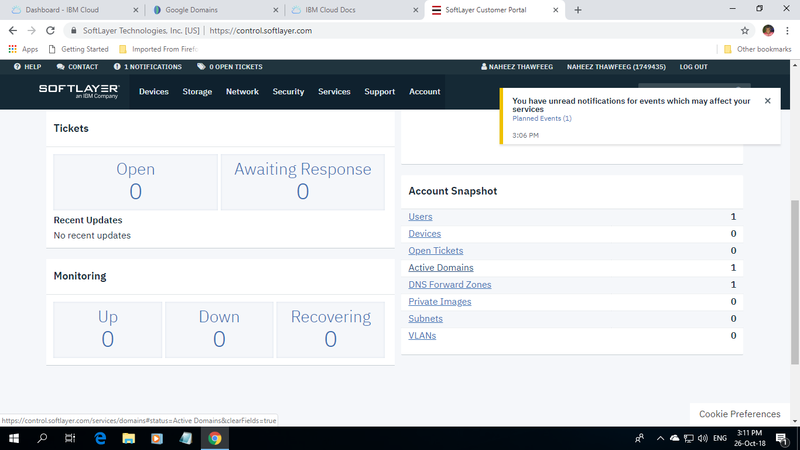 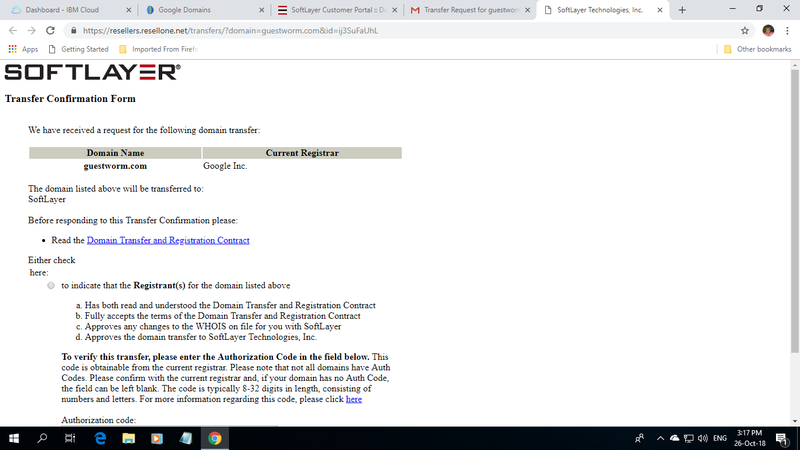 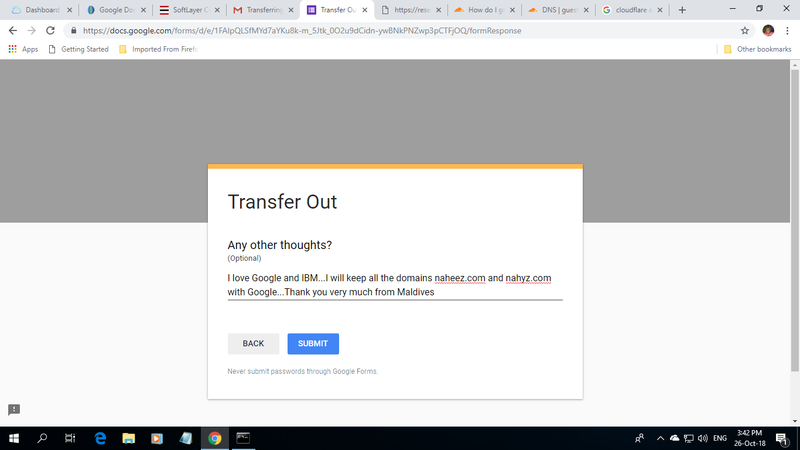 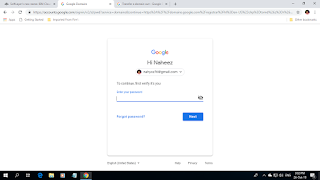 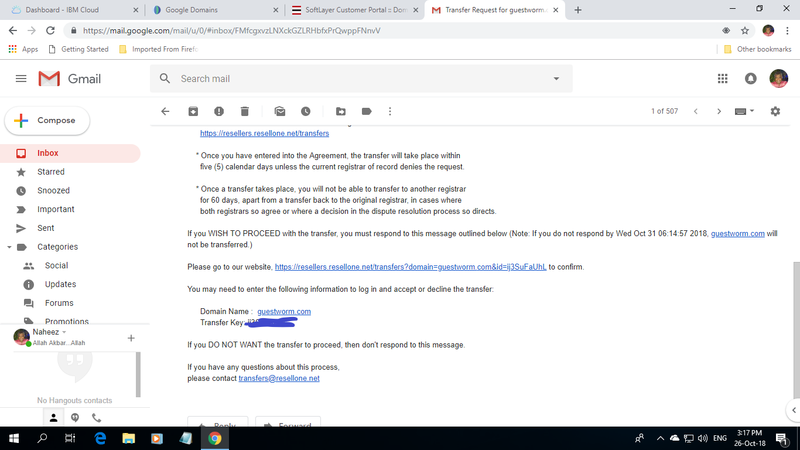 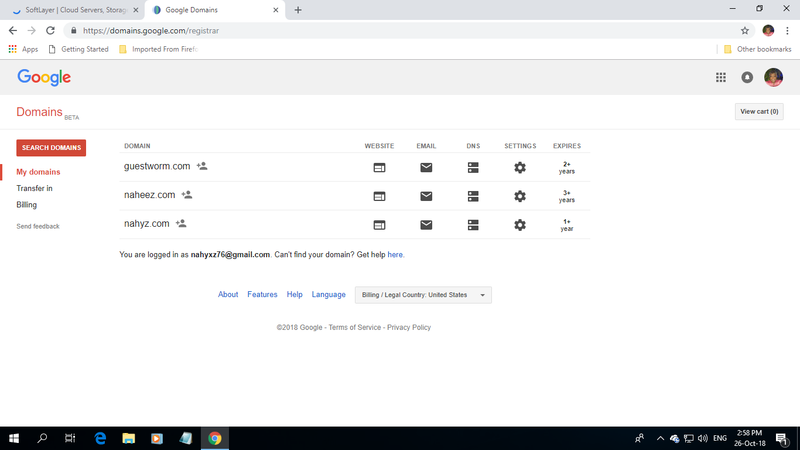 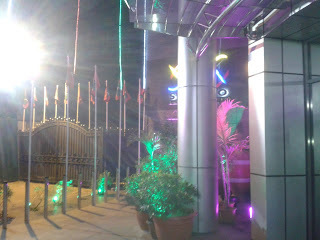 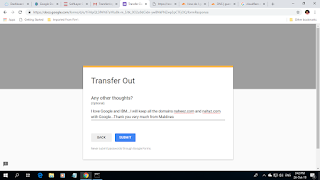 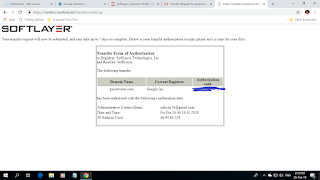 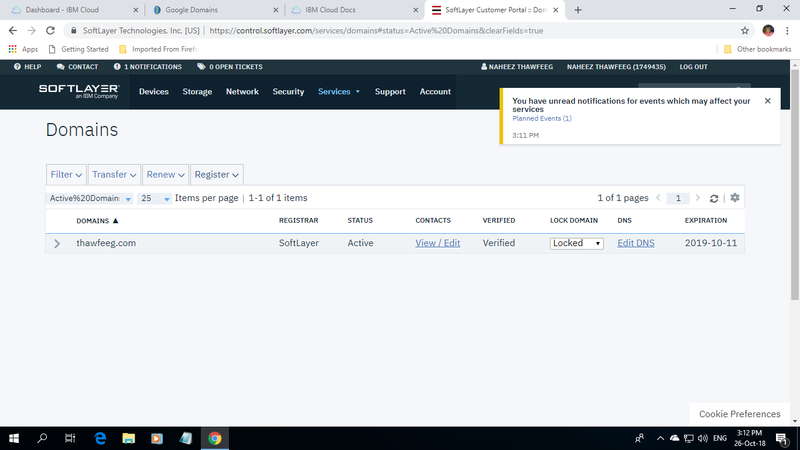 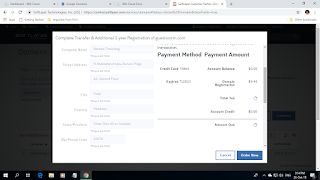 Now I have two domains (guestworm.com and thawfeeg.com) registered in IBM®, two domains registered in Google® (naheez.com and nahyz.com) and 1 domain registered in Dhiraagu (naheez.mv) of my beloved country Maldives. I am learning technology things on my own and I hope very much that I am not violating the terms of service by IBM® and Google®.